A heating and cooling system is one of the biggest investments we make for our homes, so it’s only natural we want to get the most out of them. Unfortunately, no matter how well-maintained your HVAC system might be, you’re going to have to replace it at some point. An old, damaged system can result in growing energy bills and poor indoor air quality, which no homeowner wants to deal with. Here are five indicators that a system needs to be replaced. When was your current HVAC system installed? The Department of Energy recommends homeowners replace their HVAC system every 10 to 15 years. Modern units possess greater longevity compared to their predecessors, but major components may begin to deteriorate and fail after the 10-year mark depending on how well you maintained the unit. If you can’t make your mind up about whether or not to repair your old system and it’s more than a decade old, then purchasing a new system is the better investment. All HVAC systems require an occasional repair, but if your current system starts racking up repair bills and begins to cost as much as a new system, that means it’s time to invest in a new one. In Texas the seasons don’t change too drastically, so if you notice your bill increasing significantly, it’s most likely not because you cranked up the heat and forgot. Rather, it’s most likely due to your aging system not operating as efficiently as it should be. Regular maintenance will help to increase the lifespan and efficiency of your HVAC system, but at some point, an upgrade will be necessary. Upgrading to a high-efficiency system can cut your monthly energy bills by as much as 20 percent. As an HVAC system ages, it may begin to struggle regulating the temperature in your home. This could be the result of a variety of issues such as a damaged thermostat, low fluid levels, clogged filters, cracked ducts, or damage to the motors. Temperature inconsistency typically means that your air conditioning system isn’t powerful enough, you have bad air flow, or the duct work isn’t properly installed. In either case, keeping the existing system will result in an unfavorable home environment and may even raise your energy bill. On top of supplying cooled and heated air into your home, your HVAC system is responsible for proper ventilation. If your system is operating efficiently, it should improve the air quality in your home by removing dust and other allergens as well as maintaining the humidity level. If you begin to notice an increased amount of dust and other allergens in your home, that could be a sign your HVAC system isn’t up to par anymore. 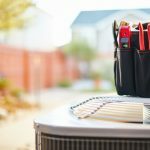 Need an HVAC Expert in the Houston Area? If you’re looking for professionals in the Houston-area who can help make the HVAC assessment process easier, then you don’t need to look any further than Air Specialist. We have the expertise to help you choose the perfect heating and air conditioning system for your home. If you’re interested in any of our services, please give us a call at (713) 481-1305 or schedule an appointment online!